Reality and the spirit world collide together in a compelling story. 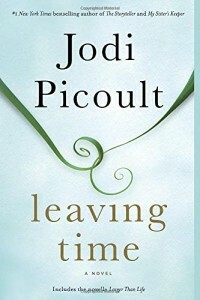 This is the first novel I have read by author, Jodi Picoult, but I’m very glad that I did. 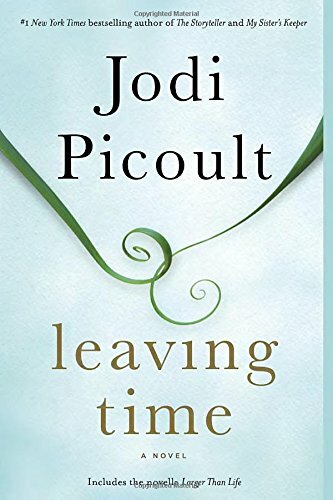 Leaving Time brought tears to my eyes more than once, and if it is possible to have some kind of emotional attachment to a story, this one did it for me. The story is told in more than one narrative viewpoint. A decade after a fatal incident at the Elephant Sanctuary in Tennessee occurs, three characters set out to solve the mystery of missing person, Alice Metcalf. We have Jenna, Alice’s thirteen year old daughter, Virgil, a down-and-out Detective, and Serenity, a fallen from grace TV Psychic. Quite an oddly eclectic bunch to string together, but somehow Picoult effortlessly weaves together the fabric of their lives, hopes and fears in an astonishingly authentic way. Through reading her mother’s journals, Jenna attempts to find out how she disappeared and why she had abandoned her. At least two thirds of this book will teach you about the behaviour of elephants through Alice’s viewpoint.. I particularly loved the portrayal of how elephants interact as a herd, and how they grieve for their young. I found that I lost myself in most of this text. Whilst I realise that some reviewers disliked this part of the book, for me it was an eye-opening revelation and almost a dedication to their memory, inducing pity and highlighting the sad plight of their cruel mistreatment by humans. From the Author’s Note, we can see that she undertook a huge amount of research in exploring these animals, hence I felt that the chapters did not detract from the story, but enhanced it in a way that skimming over the surface would have been the difference between a profound and deeply rooted story to one that merely lies flat on a bed of freshly mown grass. As the trio finally come to the end of their search and the threads of the story are wrapped up, a major plot twist is revealed which I did not see coming, and though you might have to suspend disbelief in order to fully appreciate it, Picoult’s writing is so competent; it works! One of the best reads I have picked up in a while.